With non-surgical intermittent impression, also called intermittent pneumatic compression (IPC), the limbs are enclosed by special technical sleeves that are operated by a control unit. Various devices are available with the most significant difference being the number and arrangement of the air chambers in the sleeve and the duration of the pressure cycle. The pre-defined intermittent pressure is generated by alternately filling and emptying the air chambers in the sleeve. In this way the natural movement of the muscle pump is initiated and veins and lymphatic vessels are supported in performing their function. Edemas are relieved of congestion, venous and lymphatic return is effectively improved. 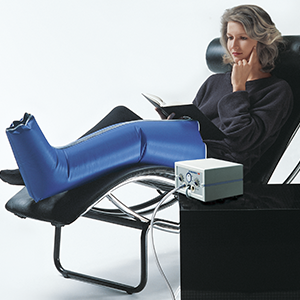 Suitable for the treatment of venous disease are systems with 1 to 6 air chambers. The 12-chamber systems, whose air chambers overlap, are used to treat lymphatic edema. The IPC is also suitable for preventing thrombosis. This kind of treatment is usually carried out at home. However, there are also devices with which it is possible to carry out IPC as an out or inpatient. Is IPC the prescribed therapy, medical compression stockings must also be worn to maintain the therapeutic success achieved and prevent any renewed increase in volume. In the case of lymphatic edema IPC complements physical decongestion therapy. With this indication manual lymphatic drainage is usually required.